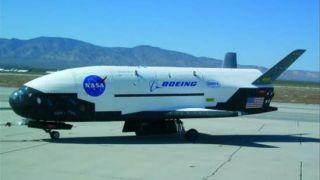 The unmanned X-37B space plane built by Boeing's Phantom Works division is undergoing orbital flight tests for the U.S. Air Force. The secretive X-37B robotic space plane is about to set its own space-endurance record on a hush-hush project operated by the U.S. Air Force Rapid Capabilities Office. The craft, also known as the Orbital Test Vehicle-2, was boosted into Earth orbit atop an Atlas 5 rocket from Cape Canaveral, Fla., on March 5. Tomorrow (Nov. 30), the X-37B spacecraft will mark its 270th day of flight — a lifetime in space that was heralded in the past as the vehicle's upper limit for spaceflight by project officials. "It's still up there," U.S. Air Force Maj. Tracy Bunko of the Air Force Press Desk at the Pentagon, told SPACE.com, noting that project officials planned for a 9- month-plus mission, "so we're close to that now." Built by Boeing's Phantom Works, the X-37B spacecraft is about 29 feet (8.8 meters) long and 15 feet (4.5 meters) wide. It has a payload bay about the size of a pickup truck bed. The X-37B resembles a miniature version of NASA's space shuttle. Two X-37Bs could fit inside the 60-foot (18-meter) cargo bay of a space shuttle. The U.S. Air Force Rapid Capabilities Office "expedites development and fielding of select Department of Defense combat support and weapon systems by leveraging defense-wide technology development efforts and existing operational capabilities," according to an office fact sheet. "Currently, RCO is working on the X-37B Orbital Test Vehicle to demonstrate a reliable, reusable, unmanned space test platform for the United States Air Force," the fact sheet explains. As first reported by SPACE.com in early October, the extended flight of the craft was in the cards from the beginning, said Air Force Lt. Col. Tom McIntyre, the X-37 systems program director. McIntyre said that X-37B controllers initially planned a 9-month mission but would try to extend it "as circumstances allow." He added that more flight time would give program officials additional experimentation opportunities and permit its operators to extract the maximum value out of the mission, he said. "The X-37B OTV team is pleased to announce that we've achieved a milestone of 270 days on orbit, one of our original test objectives," McIntyre told SPACE.com. "This successful flight is important in the progression of the X-37B program, moving us forward in our effort to prove the utility and cost-effectiveness of an unmanned, long-duration, reusable spacecraft. We look forward to trying to expand the platform's envelope by extending the mission further. We're extremely proud of this accomplishment ... I'm extremely proud of the men and women who have worked so hard to make this mission such a tremendous success." The maiden voyage of the first winged X-37B took place in 2010, a mission that lasted 225 days. That inaugural trek started on April 22, and ended with a Dec. 3 touchdown at a specially prepared landing strip at Vandenberg Air Force Base in California. The vehicle now orbiting is the second craft of this type to be built by Boeing. The X-37B is operated under the direction of Air Force Space Command's 3rd Space Experimentation Squadron, a space control unit located at Schriever Air Force Base in Colorado. The payload inside the vehicle flying in space is classified. When this second X-37B flight does end, it is designed to carry out an automatic guided-entry-and-wheels-down runway landing, likely at Vandenberg Air Force Base, with neighboring Edwards Air Force Base serving as a backup. If the incoming space plane strays off its auto-pilot trajectory as it zooms over the Pacific Ocean, the craft has a self-destruct mechanism. As for the future of the X-37B series, derivatives of the vehicle have been proposed as possibilities to fly cargo and even crew to the International Space Station. Arthur Grantz of Boeing Space and Intelligence Systems sketched out a host of future uses for the space plane design at a recent meeting of the American Institute of Aeronautics and Astronautics. Grantz said, for one, the X-37B as designed now can be flown to the space station and supply cargo services by docking to the facility's common berthing mechanism. A Boeing roadmap, he added, includes an X-37C winged vehicle, as well as a version able to carry up to seven astronauts into Earth orbit.